Surgeons need to handle many sources of information in increasingly technologically complex operating rooms (OR)s. Included are digital imaging archives (PACS), medical informatics systems, intra-operative imaging (fluoroscopy, MRI), video (endoscope, microscope), computer assisted surgery systems. Operating room medical video streaming and recording systems allow a surgeon to manage the information sources in the operating room. Captured video can be put on larger screens for easy visibility or teaching, while streamed video can be shared with consultants for real-time consultation and recordings can be used for training. 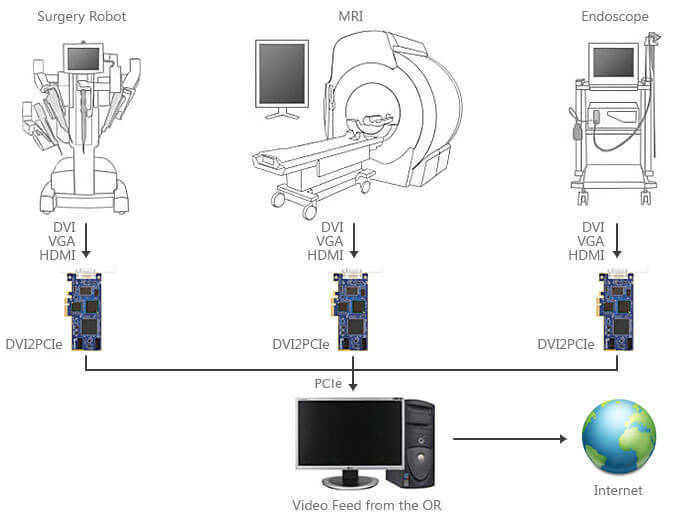 The operating room video recording system consists of a computer with a high-definition flat panel connected to multiple DVI2USB 3.0 or DVI2PCIe frame grabbers with access to the video sources in proximity to the surgical site. The surgeon can record, or transmit capture video from the source to a remotely located viewer over the network using available frame grabber software or their own image workflow systems. Data archiving is performed on a computer’s hard disk or the application can push the video and images into the hospital’s image processing workflow. To capture from various medical equipment with VGA, DVI or HDMI™ out, system integrators can use multiple DVI2USB 3.0 video grabbers. No matter the source, DVI2USB 3.0 provides high quality, accurate video capture at resolutions up to 1920×1200. SDI camera sources can also be captured with SDI2USB 3.0. 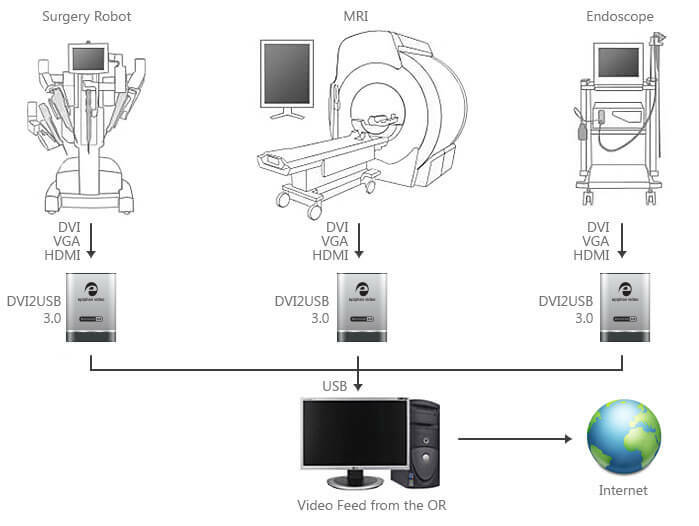 DVI2USB 3.0 grabs video from any equipment installed and used in the operating room providing that it has a VGA, DVI or HDMI video output connector.The device is small and lightweight. The video source is captured by the frame grabber and is transmitted to a computer with installed video capture application software or DICOM/PACS workflow software that supports DirectShow interfaces. Once the images or videos are captured with DVI2USB 3.0 they can be viewed, recorded, archived or streamed over the network. For example, video and images from cameras integrated into the surgical light or attached to endoscopes, ultrasound, registered orthogonal CT, hemodynamic monitor, mobile C-arm, or radiological images. As an alternative to external video grabbers, Epiphan’s internal PCIe capture cards also capture VGA, DVI, HDMI and SDI sources. Multiple cards can be installed in the same computer and capture at 80 fps, with resolutions up to 2048×2048.